Professor Matthew Jager, Business Department, Visiting Professor of Marketing. Has been with Saint Rose since 2008. Where have you been employed? My only ‘grownup job’ was at Plug Power, a local manufacturer of hydrogen-powered fuel cells. I worked there for the last couple of years that I was working on my bachelor’s degree and left when I decided to go back to graduate school. I roasted coffee for a local coffee shop while I was working on my master’s degree. Since then I’ve worked for the University at Albany, and now The College of Saint Rose. Did you always want to teach? Nope- I started my MBA because I wanted to be a manager for a business like the one I had worked at. I did some coursework on management information systems, and I became really excited by the way that understanding information systems was leading me to understand how organizations function. I ended up staying at the University at Albany to work on my Ph.D. in Information Science, and they offered me a graduate assistantship. After a couple of semesters of mostly doing grading and office hours, I was thrust in front of a lecture center of about a hundred students to teach my first semester-length class. I loved it, and I’ve never even thought of stopping. What classes do you teach at Saint Rose? I teach Management Information Systems and various marketing courses. Last semester I was allowed to develop my own course in Social Media Marketing, which I really enjoyed teaching. Highlight of academic career, thus far: I’ve had a few opportunities to present on my dissertation research so far- nothing big, just smaller, nearby academic workshops and conferences. I love talking about my work, getting other people excited about my research topic, and I really enjoy the conversations with other researchers that follow my presentations- their feedback keeps my thinking, and my work moving forward. What’s your favorite color? My favorite color is pink. Favorite place to eat in the Capital Region? Any student who’s ever taken one of my classes could probably tell you that my favorite place to eat is the Albany Pump Station (I mention it pretty often…). Favorite TV show? My favorite TV show is How I Met Your Mother. What is the last book you read? The last (non-academic) book I read was The Dispossessed by Ursula K. Le Guin. If you could have one superpower, what would you choose? Time management. People who can actually pull this off are so rare, I’d consider it a superpower. If I’m given space to talk about anything I want, I’m definitely going to use it to mention my business. 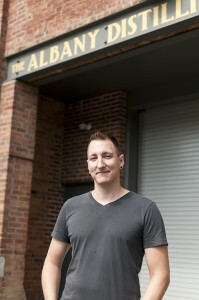 Besides teaching, I’ve spend the better part of the last two years working on opening the first legal distillery in Albany since Prohibition, the Albany Distilling Company, Inc. We’re going to produce a line of hand-crafted spirits from local raw materials, starting with a really amazing whiskey. Our products will be available before the summer. It’s been a really challenging, and exciting experience, and I believe that the real-world knowledge I’ve gained in the process has made me an even better teacher. Find more on The Albany Distilling Company, Inc. on their Facebook page. Thank you for contributing, Professor Jager! If you have any questions, please comment below!